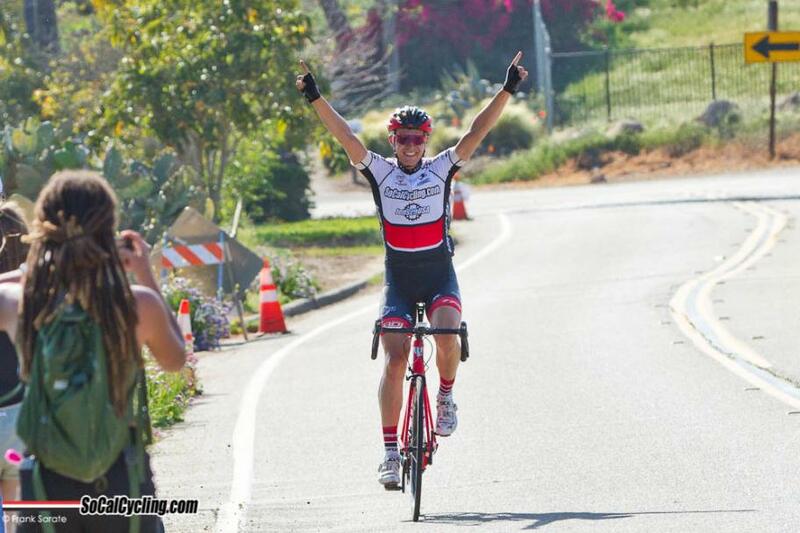 31st San Luis Rey Road Race and SCNCA State Championship is a race to remember: it was my first win in three years. Here are my thoughts about the race. Before the race, I knew my form was good, but wins are never easy and nobody gives anything away in the end. We had to do six laps of 15 miles equally for 90 miles total. The race started with a downhill the first 2.5 miles and then false flat until the turnaround and the same way back. The hill to the finish line (2.5 miles 4-5 % in avg.) was only a twice as long than the hills we have in Denmark and I assumed it wasn’t steep enough to get rid of the heavy Dane. With Elevate – KHS, LABC and Jelly Belly represented in the race, it was a strong field and we knew it was going to be a hard race. Our Team Director Frank Sarate told us there properly would be an early break and we should try having one or two guys in that. Personally, I would really like to be in the right move from the beginning that’s how I like it. I already rode the race in my mind the night before; be in the breakaway, make an early attack and go solo the last 2 laps. However, I was the only one who’s doing that in my dream. The first lap, I covered moves with my SoCalCycling.com Team teammate Leo Bugtai in the front of the field. After 6 miles, Ben Foster (SoCalCycling.com Team) went away with a few guys and not long after Chase Goldstein (SoCalCycling.com Team) bridged with a few guys as well. Perfect! We had two teammates in the break exactly as planned. Leo, Ethan Batt and I went to the front of the peloton and covered moves so we had the opportunity to free ride to the break if somebody was strong enough to bridge. The break went out of sight and we came closer to the hill. 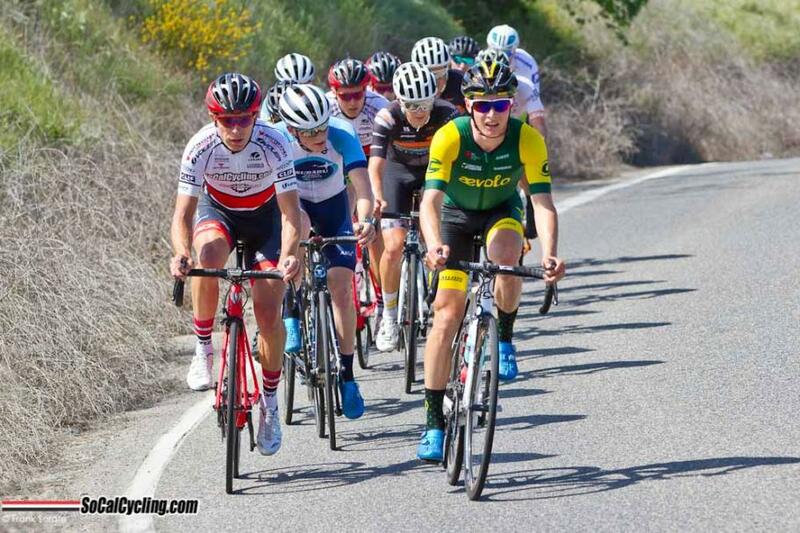 There were a few attacks and suddenly I found myself on the wheel of Callum Gordon (Team California) attacking up the hill. I was really suffering but I managed to keep his wheel and knew this could be my ticket to ride across to the move. We were four or five in the group and I used my teammates in the front as my excuse not to do anything at all. We bridged in a half lap. 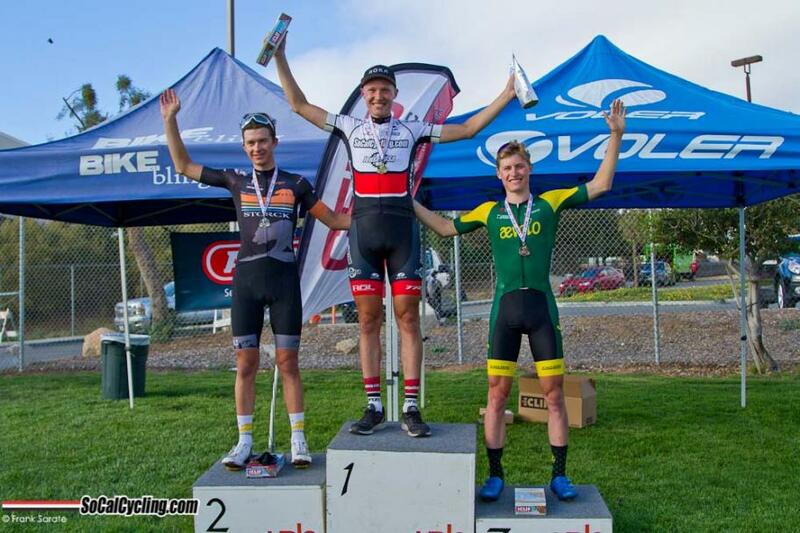 Now we were 14 guys in the break; 3 from the SoCalCycling.com Team and no one from either KHS-Elevate or Jelly Belly. The cooperation in the group was good and we only had a few passengers. The gap went to around one minute and kept that gap the next two laps. There was a bit discussion how hard we should go on the climb; steady or hard. I would like to go hard so everyone had to suffer from the beginning (and because one minute wasn’t long if the field decided to go bananas on the climb). I told Ben and Chase I would attack on the hill on 4th lap (like in my imaginations), but Chase reminded me that there still were 30 miles to go from the top of the climb and it probably would be more rational to set a higher pace than attack. I agreed with him but did both. I was now in front of the race. I felt good, but there were still 30 miles to go and I had only 5-10 seconds back to the group (now 10 riders). At least Ben and Chase now had an excuse to save energy while I was away. I lasted for a half lap and now it was my turn, so I saved some energy in the back. Surprisingly, it didn’t seem like the other guys in the break had any problem with me saving energy and not pulling. In Denmark, they would have shouted and tried to ride me in the ditch, it was nice Americans as maybe they thought I was done for the day. No matter, I started to work again, because I would not be stamped as wheel sucker. On the hill, we dropped a few more guys including Ben who ended up getting rear flat and a right and left in the legs, so we now were 8 left in the front. Again, I attacked on the top of the hill, but they had figured me out and I didn’t get away. It was the last lap and we agreed to work together because the field still was now less than a minute away. My legs began to feel sore, but it looked like the others were struggling even more. I really had momentum in my pulls and I was able to drive the break. Even though I felt strong on the flat sections, I feared the hill. My plan was to get away before the hill and keep my own pace uphill. Chase was doing really well in the group. He told me he wasn’t feeling that well, but he still pulled hard and when there came disagreement about working in the group he attacked and I could save energy in the back. With 3 miles to go, I tried an attack but was closed down immediately. Instantly, I pulled hard again (not really an attack) and I could see that no one wanted to take up the responsibility and I knew this was my opportunity. I got a gap of 10-15 seconds in the bottom of the hill and focused not to ride out of my comfort zone, but keep in control. When I looked back I could see three or four guys getting closer to me and if one of them had sacrificed himself they might have been able to catch me. When I was on the top I knew I would win and accelerated one last time towards the finish line. What a feeling winning riding solo away from the breakaway. The last time I did that was in 2013. And what great teamwork; with threeSoCalCycling.com Team teammates in the break and Leo and Ethan covering moves in the field if the race opened up again. I’m a bit ashamed of my celebration (which I haven’t practiced in such a loooong time). When I tried to raise my hands from my handlebar with 600ft to I almost lost control of my bike and nearly crashed (I don’t hope you got pictures of that J). My second try was better as I had some practice space to get it right! 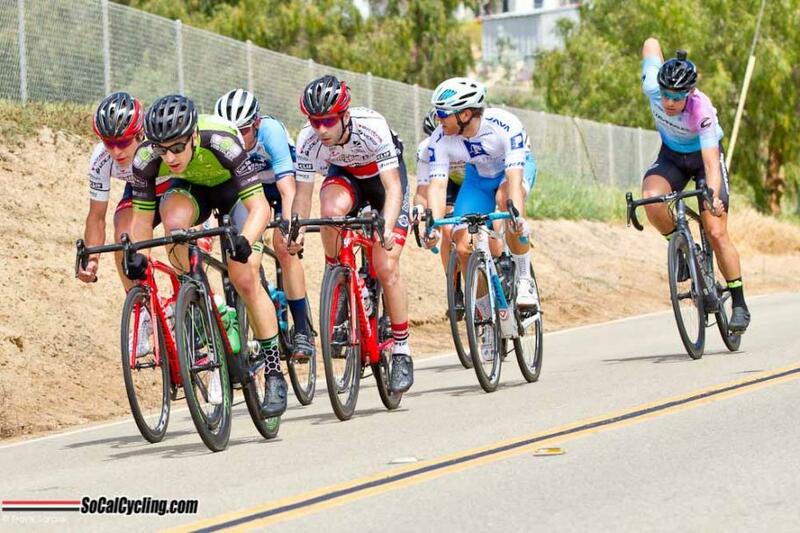 Many thanks to the organizer of the 31st San Luis Rey Road Race for a good and safe race and to my great teammates for doing a great job and our sponsors to make it all possible! SoCalCycling.com, Jenson USA, Bottecchia, Voler Apparel, Clif Bar, FSA, Gizmo Cycling, Union Sport, Hyundai San Sebastián, ROL Wheels, TRP Brakes, Caravan Canopy, KMC Chains, Bell Helmets, Echelon Design, ROKA, Larsen’s Restaurants and SCC Slick Chain Lube.